You have no idea how I strove to witness the Hot Air Balloon Fiesta at Clark, Pampanga. I would like to thank my cousin-in-law, nieces and their boyfriends for the spontaneous instantaneous trip. A Saturday away from work engagements, I haven’t felt saturday as much as I did – carefree, kid like and with my relatives. Two has been off my bucket list. 1) Attend Hot Air Balloon Fiesta and 2) Be out and about with my nephew/nieces in a splendid trip a family can call “free day away from civilazation” and they were in charge on the whereabouts. We all get older and wiser fast year after year, I’m so proud to have such nephew who speaks like a trivia master in every sentence, nieces who are independent, smart and never left their family orientation. When I have kids of my own, I would love to have that kind of relationship: Be a group of cool people, goes out of town without their kids feeling awkward that they’re with their parents and are as open as they are with their friends to us, their parents. My relatives picked me up at around 2am with zero sleep, we picked up my niece at her condominium near UST and off we drove to Clark, Pampanga. Blessed with no hassle on the parking space and no gruesome traffic, we arrived Clark 20 minutes before 5:30 am. Because we arrived early, we encountered the luxury of getting in smoothly. Strolled as we entered, found exhibits from the Navy: the plane, armor, trucks and bullets. Surpassed the educational preview, we positioned ourselves at the back of Fern-C where my cousin’s teammates’ drift car was showcased. Lucky us, we were able to use the seats allocated to the booth – had the chairs seated side by side, sat tight and stood on the stools as we waited for the event commence. Tip #2: If you can, purchase the ticket early. Ticketnet was selling but if you commit to be at the area early – you can purchase the tickets hassle free, too. Tip #3: Bring handy-dandy stools or have the picnic essentials especially mosquito repellant lotion. Tip #4: Wear comfortable shoes, not heels. I saw ladies who had a hard time coz of their foot wear. Que Horror! 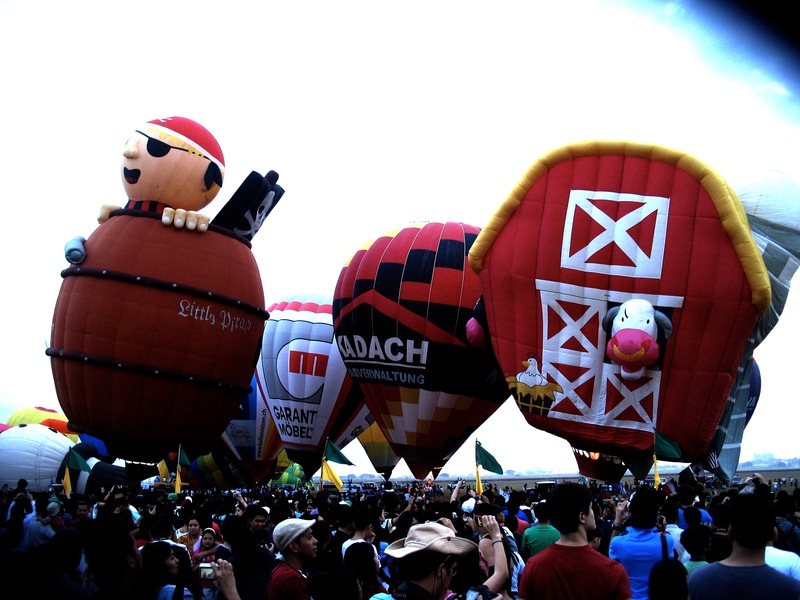 Tip #5: Should you wish to ride the balloon, prepare at least $300 for you and your partner and reserve ahead! Not unless you were granted a sponsored flight up, up in the air! People clamored within their own area with picnic rugs, stools and had their cameras set to shoot as soon as the numerous paraglider appeared up in the sky to showcase the start of aeronautics theme. My nephew, a geek by all means who has tons of trivia within his sentences remained on awe and lost his trivial notes as soon as he got his curiosity radar up. Took photos like giddy little girls and boys, stood on the stools and took photos in different angles – from the time the balloons were still being transported in the area, inflated and until everything were already up in the air. Reading reviews, I was quite looking forward to an “up” experience. I was quite hoping they’ll have the “up” balloon but to no avail. Our favorite centered to the barn house, the mushroom which reminded us of Super Mario and Darth Vader. Uh, there was this upside down balloon which was a little disturbing. Was it really made like that or something went wrong? As the sun rose, you’ll be able to see pretty colors up in the air then the paraglider showed-off few exhibition stunts; men, women and kids flying a kite. You’ll notice kite in the image of Spider man, bats, hearts and planes. It was delightful witnessing kids flying the kites with their parents and those parents who took their kids for the experience. There really is nothing like family bonding outdoors, such excitement computer games can never replace nor be compared. After the hot air balloon experience, we strolled the exhibition area where clothes, toys and other merchandise were sold. Souvenir shirts were available for Php 300, mugs for Php 50 – Php 100 and accessories for Php 50 – Php 350. We decided to eat out at Coffee Academy for some orderly heavy breakfast, a roadtrip to kill time and slept in the car, visited Clear Waters for the younger ones check what can be done while I and my cousin slept in the car (sign of old age? ), drove back the hot air balloon area and saw Helicopters clouded the sky. Albeit we weren’t able to go down and witness the rest of the itinerary, I’m sure the skydiving exhibition was something insightful ( I actually want to do that someday, one day). We wanted to attend the hot air balloon night glow but my nieces had and will have a hectic week ahead, off we drove back to Manila. Congratulations to all organizers of the 16th Philippine International Hot Air Balloon 2011 and the sponsors who took part and supported the Philippine Aviation!